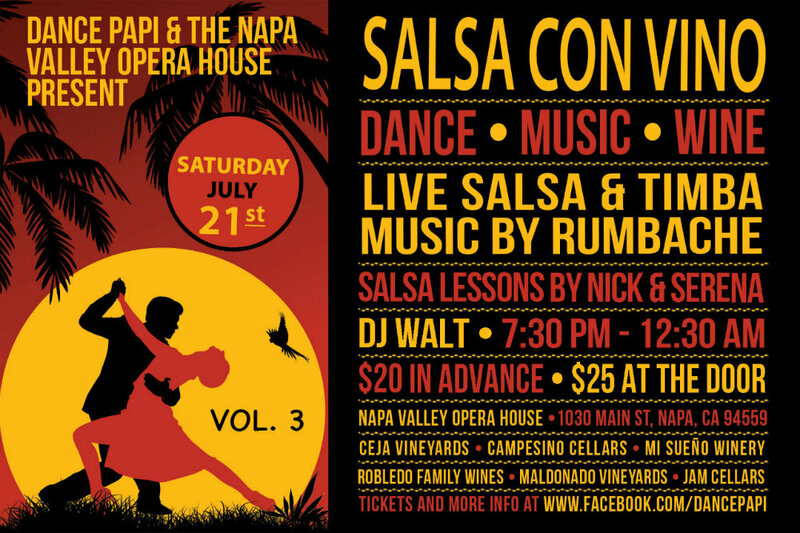 Dance Papi and the Napa Valley Opera House present “Salsa Con Vino (Vol. 3),” a lively celebration of dance, music and wine on Saturday, July 21st. This community dance event includes live salsa and timba music by Rumbaché, salsa lessons by Nick and Serena and DJ Walt Digz to keep things hot on the dance floor. Rumbaché has established themselves as one of the hottest Bay Area Salsa Bands! Fusing salsa, timba, bomba, funk and whatever else they can find to spice up the mood, they provide a hard hitting style of playing. And while you can hear them interpreting the classic and contemporary Cuban and Salsa repertoire, they are not shy with their own expression, as evidenced by their hit debut CD “Llego La Fiesta”, released in April of 2011. Rumbaché is the voice of youth for San Francisco's Salsa & Timba scene, and ignites enthusiasm in dancers and musical connoisseurs alike. Nicholas Van Eyck and Serena Wong are the founders and directors of Salsa Vale Todo: the premier Bay Area Cuban salsa dance group. Dancing professionally since 2000, this dynamic duo have taught and performed at salsa congresses, festivals and cruises throughout the US and internationally. Nick and Serena are also the organizers of the famed San Francisco Salsa Rueda Festival that takes place every February and the historic Hotel Whitcomb. For over a decade DJ Walt Digz has been one of the most requested salsa, timba and reggaeton DJs in Northern California. Walt Digz’s great song selections, mixing skills and ability to elevate the mood of any dance venue keeps him in heavy rotation at numerous Bay Area clubs and dance festivals. - Ceja Vineyards is an ultra-premium Latino family owned winery founded by Amelia, Pedro, Armando and Martha Ceja – first generation Mexican-American winegrowers in the Napa and Sonoma Valleys. - Campesino Cellars produces Rhone style wines from select single vineyards in California. Their wines are not only a reflection of those who tend the vineyards, but they also express the qualities inherited from their site specific locations. - Mi Sueño, which translates to "my dream," is a micro-production winery that produces high-end wines from both the Napa and Sonoma valleys. Founded in 1997 by Mexican immigrant Rolando Herrera, it has grown from 200 cases of Chardonnay annually to its current production of approximately 8,000 cases. - Robledo Family Winery produces a diversified portfolio of ultra-premium wines from Sonoma, Napa and Lake Counties. A member of the Robledo family is on hand to greet you as you enter their tasting room and will proudly share their family's’ journey to achieving the “True American Dream”. - Maldonado Family Vineyards is a small-production winery located in Calistoga, a beautifully quaint town in the Napa Valley. In 1961 Lupe Maldonado moved to California from the small farming community of Atacheo, Michoacan, Mexico. In 1998, Lupe bought and developed a 10-acre vineyard in Napa. His son Hugo, a graduate in Viticulture and Enology from the UC Davis, now oversees the making of their limited production wines. Introducing our 2017 Bella Flor Rosé of Syrah. 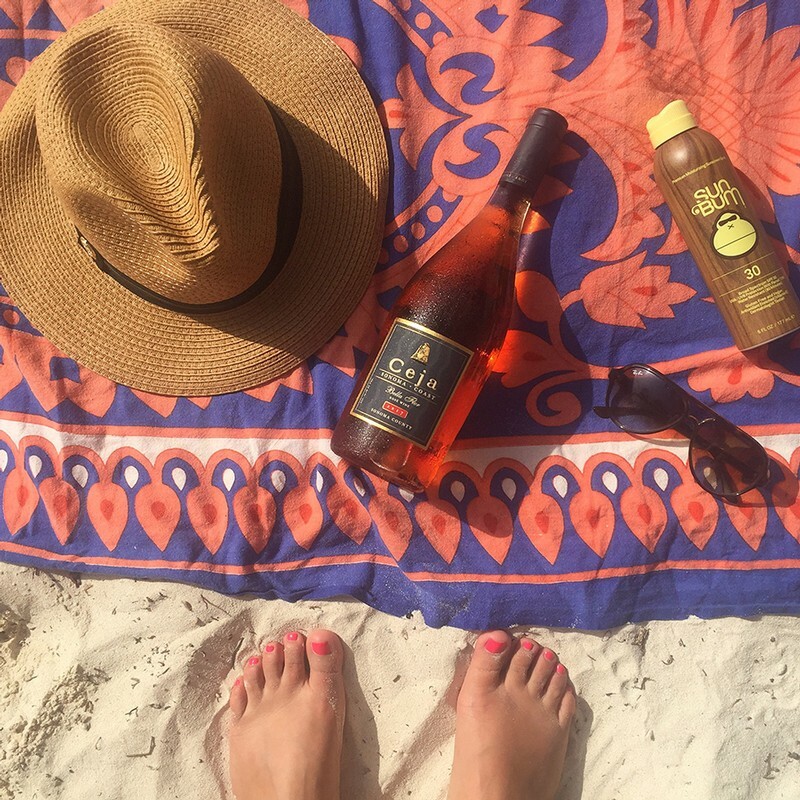 Step into summertime while sipping on our crisp, refreshing + elegant rosé! I just got back from my bachelorette in Playa Del Carmen and this rosé was made for the beach, porch sipping, poolside enjoyment AND pairs perfectly with seafood/spicy dishes. Yes, please! Available for purchase now! Buy through our website or in our Sonoma wine tasting room!